We seek permission and support from the Lebanese authorities to carry out a preliminary survey and investigation of the Rachaiya South Basin and the surrounding area. We also seek to encourage the Lebanese authorities and where necessary others to assist in planning and organising the necessary archaeological and environmental surveys to substantiate the evidence gathered through the research and translations of ancient texts by the authors of The Genius of the Few - Christian and Barbara Joy O'Brien. To discover whether there are physical features and dated farming evidence, to establish beyond reasonable doubt, the actual Kharsag or Garden of Eden, as portrayed in the Sumerian, Arabic or Hebraic literature, at this site. 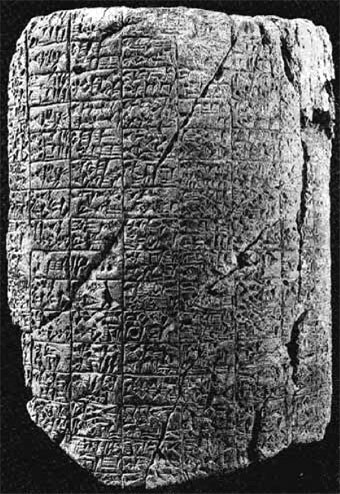 Nippur Archaic Cylinder - To judge from the script, the Nippur cylinder illustrated on this plate (8383 in the Nippur collection of the University Museum) may date as early as 2500 BC. Although copied and published by the late George Barton as early as 1918, its contents, which centre about the Sumerian air-god Enhil and the goddess Ninhursag, are still largely unintelligible. Nevertheless, much that was unknown or misunderstood at the time of its publication is now gradually becoming clarified, and there is good reason to hope that the not too distant future will see the better part of its contents ready for translation.